Free Spirit Books has been a favorite for me for some time. I like that their books teach lessons and have fun at the same time. I like that the books cover topics that can be used as a tool of discussion for topics an adult is not sure how to approach. I love to have board books since my son can throw them and step on them and I don't have to worry about him damaging them too much. When I had the chance to review two board books from Free Spirit Publishing line of toddler books I immediately knew which books I wanted to read. The first book we read was Germs Are Not For Sharing. I thought this was perfect time to teach him about hand washing and covering his face. I do know he is a bit small to do these habits on his own but I feel now is a good time to read about it and see mom and dad exhibiting those behaviors. We have to teach kids about learning to share but with germs, especially during the holiday seasons, we have to teach them when not to share their germs. 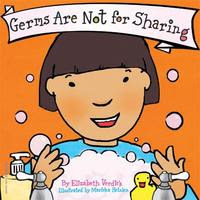 I liked the simplicity of this book and how it shows kids to cover their sneezes and when they need to wash their hands. In the end it shows kids how to blow a kiss when someone is sick as to not share germs but still show your love. I found this book to be cute and helpful. The second book we read was Clean-Up Time. This book arrived in perfect timing since we just got a new toy organizer. My little guy does help somewhat when we pick up his toys. He grabs a toy and tries to put it in the toy chest but most of the time he takes out what I am putting in. I liked that this book made cleaning a group effort and they praised the children for cleaning. I think so many parents expect kids to clean up and forget to give praise for it. This book made me think of one of my favorite movies Mary Poppins and the scene where the children clean the nursery. Since we don't have the magic of Mary I think this book will help teach kids it can be fun to clean up. In honor of my son's 1st birthday Free Spirit Publishing has agreed to send one of my lucky readers a copy of both the books I reviewed Germs Are Not For Sharing and Clean-Up Time. *Limited to US residents; 18 years old and above. Giveaway starts November 22, 2010 and ends December 6, 2010 at midnight PST. Winner will be emailed and has 48 hours to respond before another winner is selected. I was not paid for this giveaway or post. I was provided a free copy of two Free Spirit Books for this review. Follow Free Spirit Publishing on twitter. Like your Fanpage on fb. Like Free Spirit Publishing on fb. I follow socknboots on twitter. I am currently like you on facebook. I like the Manners Time book! Entered the Free Product Coupon Giveaway!